Wouldn't it be great to know exactly where your samples are so you can retrieve them in seconds, not minutes? Did you know that each time a -80 freezer is opened the clock starts ticking, not only for those materials stored inside, but for the compressor which must now work harder to restore optimum temperature? We understand that being organized is so critical to maintaining the health of the lab and improving its workflow. That is why we provide our staff with extensive training on freezer customization, so that they may assist you in choosing the right rack for your specific material. 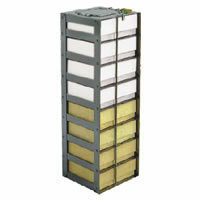 Many are unaware of how many different kinds of racks there are, each designed for a particular application. This very popular article we wrote illustrates how we assisted a customer in creating a super neat and organized lab freezer with the correct selection of the right freezer rack for their application. Stellar Scientific has close to two-thousand different freezer racks in our catalog and we can have freezer racks customized to meet nearly every lab freezer need. For clarity and brevity we've listed the most popular freezer racks here and broken them down by category. 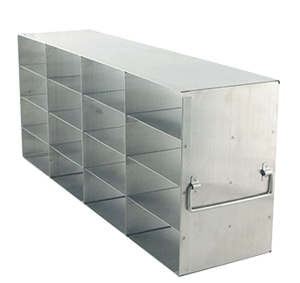 Look for freezer racks for upright freezers and racks for chest freezers listed in separate sections. Each section is then subdivided based on the the type of container your freezer racks will need to hold. Finally, each freezer rack image sports a medallion that allows you to quickly know the capacity and orientation of the rack. Because freezer racks are configured to best fit the depth and height of each freezer, it is possible for two racks to hold the same number, but with a different configuration. Use the "compare product" feature to quickly narrow down your search to the exact fit you need. For more complete service we recommend speaking with your local rep or giving us a call to discover the services we offer to make your freezer neat, clean and efficient. Call us today at: 1-844-300-7857 or follow this link to send us an email describing your storage needs. We will respond quickly and work with you to create a customized solution, just for you!